The camel, once referred to as the “ship of the desert” for the Arabian Peninsula, is one of the most enduring icons of Arabia. As Richard Bulliet argued almost half a century ago, the camel became the beast of burden and linguistic invention in Arabia because they did not re-invent, so to speak, the wheel. If you have ever seen an advertisement for “Camel” cigarettes, the oriental aesthetic is quite blatant. The number of camels throughout the Middle East declined dramatically in the last century, but it has not gone the way of the American Buffalo. As long as tourists want a picture in front of the Sphinx atop a camel and wealthy Gulfies relive their past through camel races, the one-humped camel will survive long into the future. In Arabia the camel is still quite newsworthy. It is rather ironic that Saudi Arabia, which prefers that its women cover their faces and hide their feminine form, should sponsor a beauty context. But they do, only it is for camels and not ladies, at least not of the two-legged kind. This year’s King Abdulaziz Camel Festival provides a considerable monetary prize for the most beautiful camels, overall a total of 118 million riyals or close to 32 million dollars for the winners. Considering that some 30,000 camels are participants in the month-long festival, the competition makes any other beauty contest look rank amateur. By the way, the Emirates has its own camel festival, but only for 25,000 single-humped participants. 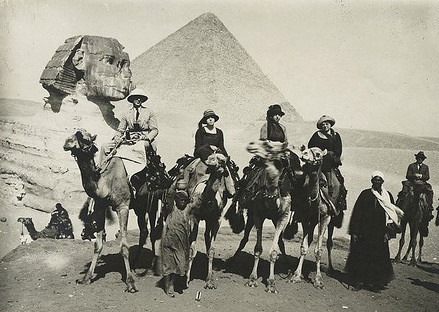 Victorian tourists posing in front of the Sphinx. 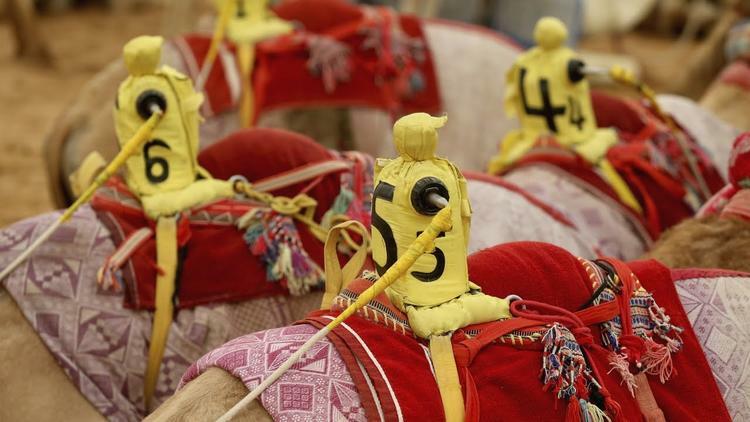 The Saudi camel festival is not just about good looks and speed, as there are prizes for the best dance and poetry. And there is a large Panoramic Dome where you can learn everything you could imagine about camels. In a rare gesture of tolerance, you can even see a two-humped Bactrian camel, which normally would live in Iran and Central Asia. Thus, those who say the Sunni Wahhabi of Saudi Arabia and the Twelver Shi’a of Iran have nothing to bring them together may be overlooking the role a shared camel connection could play. Given that there are quite a few Indian construction workers building the boutique shopping malls and skyscrapers-on-sand, it is fitting that “Indian artists” will display “great models which reflect the strong relation between camels and desert” at the festival. While there is no need for a bathing suit promenade, there are several ways in which the camels are presented in the raw. There are the group events for the best flock of 30 camels and 50 camels. Then come the individual categories. The winner of the most obedient camel will take home 50,000 Saudi riyals. But, of course, the highlight of the festival is finding the most beautiful camel. You can imagine how intense the competition must be. So what makes a camel beautiful? In the Emirates, the qualities are quite rigid: “A beauty camel is admired for its long legs and neck, a shapely hump on the lower back, a large head, thick eyelashes, clear and expressive eyes, pert ears, dropping lips and dark colouring. 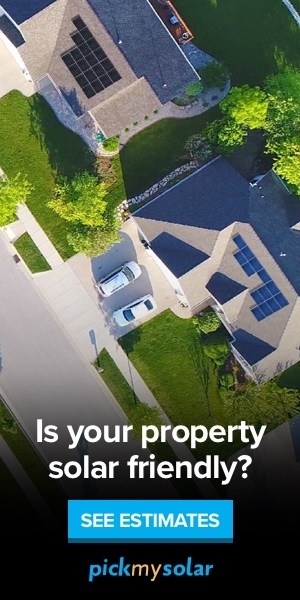 Of course, it is not all superficial. Points are also given for the camel’s composure.” No bathing suit is needed here; it would only detract from the natural beauty of the camel’s sleek body. Nor must the camel show off its ability to answer a simple question. And, it does not seem to matter whether the most beautiful camel is a female (most are) or a male. But that is not the most shocking thing. Given the prestige of having the most beautiful camel and a very large monetary prize, it should not be surprising that some owners cheat. After all, the entire Russian team is being kept out of the Olympics for their history of drug enhancement. But prepare yourself for a shock: there is corruption in Saudi Arabia. I am not referring to the arrest and detainment of some of the kingdom’s wealthiest individuals, but only about camels. 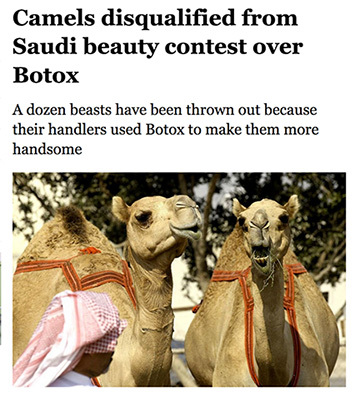 A botox scandal has eliminated a dozen camels from the Saudi competition. A source in the Emirates, however, indicates that such a scandal could not happen there, since the contestants (owners rather than the camels, of course) must swear on the Quran about their ownership and the camel’s age. “Whatever tactics employed to con judges, owners are reminded that while breeders may be judging the camels, God is judging them. This, in the end, does the trick.” Maybe this test should be given to all the Muslim leaders in the region to bring in an era of peace. 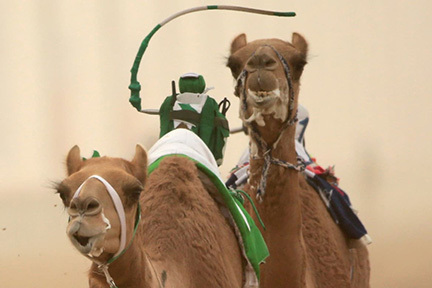 The festival website informs us that camel racing is the most popular sport in Saudi Arabia, which I suspect will come as surprise to Ronaldo. Camel racing in the Arabian Peninsula today has changed a bit from the glory days of the Bedouins. There are defined fenced-in tracks, alongside which men (in Saudi Arabia it is still only men) race their cars and cheer on their favorites. Instead of imported thin Somali boys, the jockeys are mechanical. Camel racing has evolved with moral intent in the age of Star Wars. 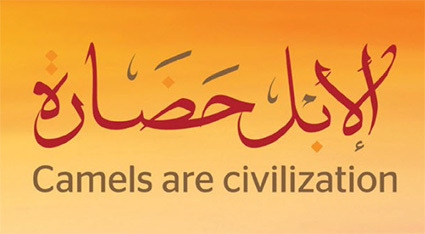 Beyond being popular, the key logo of the festival declares that “camels are civilization” (al-ibl ḥaḍāra). Before there was a central state that settled down the Bedouin tribes in eastern Arabia, they constantly raided each other’s camels. Now that the Al Murrah and the Dhafir have subdivided into the Bani Toyota and Bani Nisan, the ubiquitous Land Cruiser (or even a Bentley) would seem to be a more apt metaphor for the de facto civilization of contemporary Saudi Arabia. Daniel Martin Varisco – Anthropologist and historian with 40 years of experience researching and working in Yemen. Varisco is currently the President of the American Institute for Yemeni Studies, a Senior Postdoctoral Scholar at the Institute for Social Anthropology at the Austrian Academy of Sciences, and an expert advisor to MENA Tidningen.